Today we’re featuring the fun and bright illustrations of Ann Shen! We have actually been familiar with Ann’s work for awhile since we always come across her illustrations in different places online. 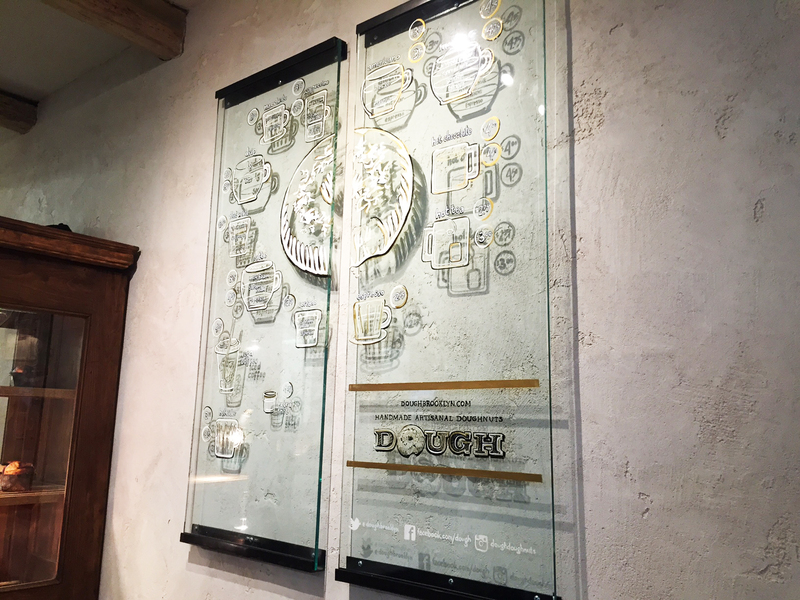 We love how her designs have an aesthetic that makes it easy to recognize her work and we’re so excited to get the chance to learn more about her. From selling her pieces on Etsy and doing freelance projects, to working on her very first book (that will be released next fall! ), Ann is one busy creative! Luckily she took the time to answer some of our questions and show us how much she really loves what she does. 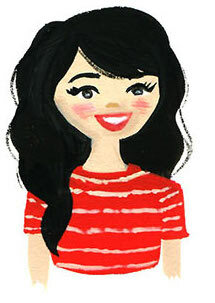 Read on to brighten up your Friday by seeing her illustrations! : Tell us a little about yourself. : Hi! I’m Ann and I’m an illustrator, letterer, and graphic designer based in Los Angeles. 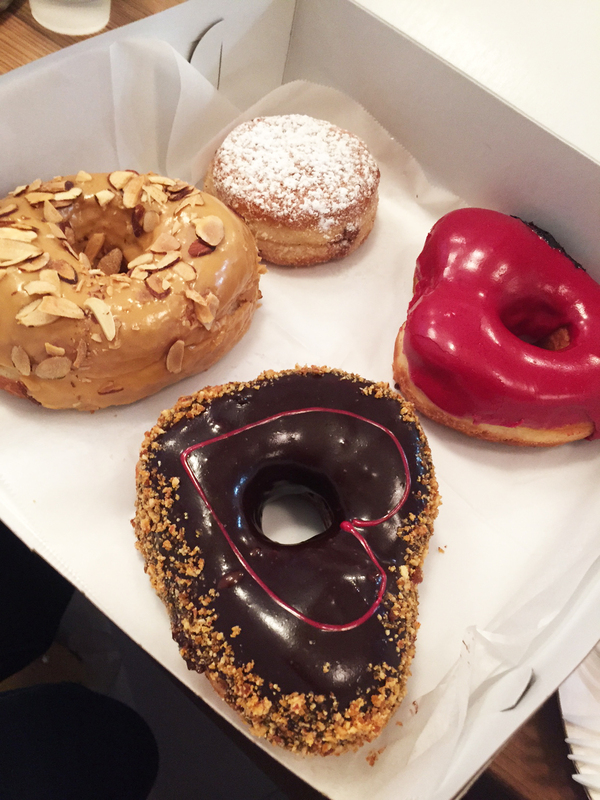 We’re super late to the game, but we hope everyone had a wonderful Valentine’s Day! Cailin and I used the day as an excuse to treat each other to basically anything either of us wanted to do. Cailin chose to go to A Gentleman’s Guide to Love and Murder, which we will cover in another post coming up this week! 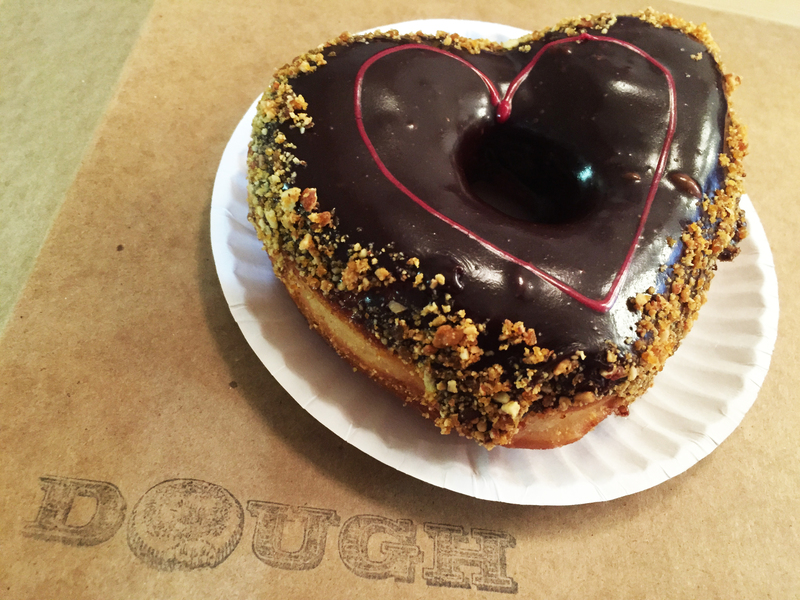 We planned on going to the show on Valentine’s Day, but missed the rush tickets so we opted to extend Valentine’s Day to Sunday and Cailin treated me to breakfast at Dough and dinner at Umami Burger, which you’ll also be able to check out in an upcoming post. 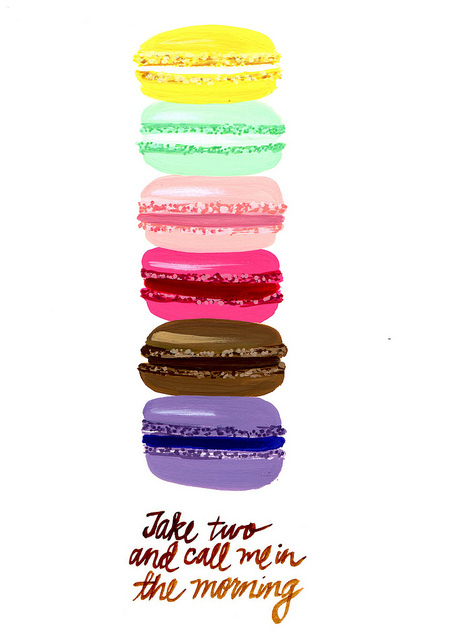 This post alone will make you hungry enough, haha! 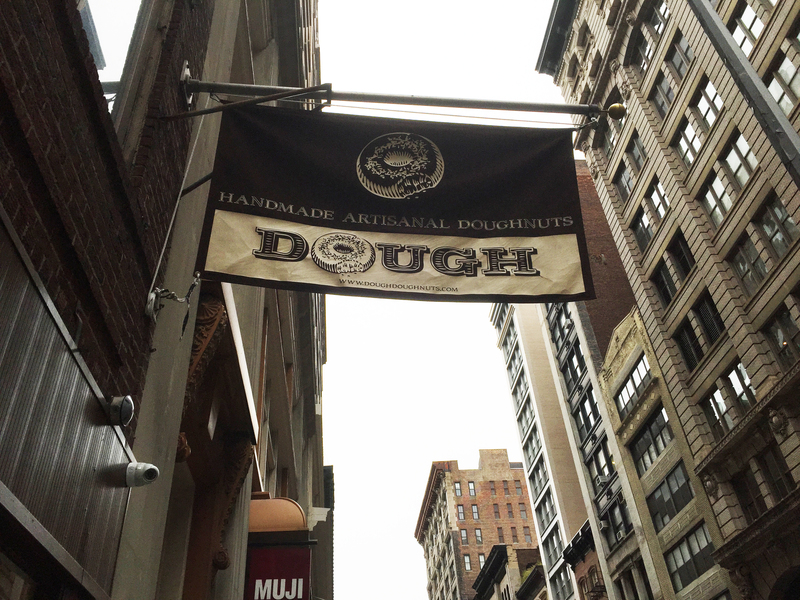 We went to the Flatiron location of Dough which originally started in Brooklyn. It’s a small space with only one large table for seating, so you may have to stand around stalking out a seat for a little while if you plan on eating there. 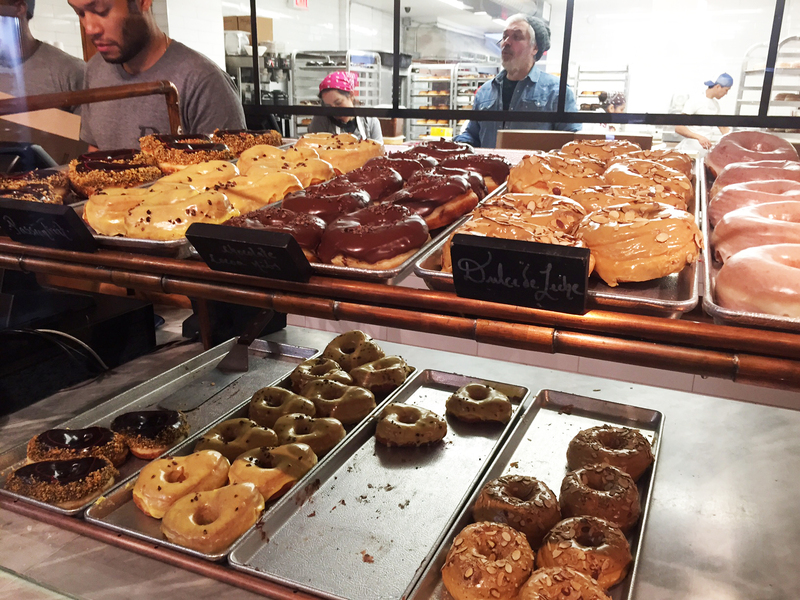 All the doughnuts looked absolutely delicious, so it was really hard to choose, but I ended up deciding on the Hibiscus and Dulce de Leche flavors. 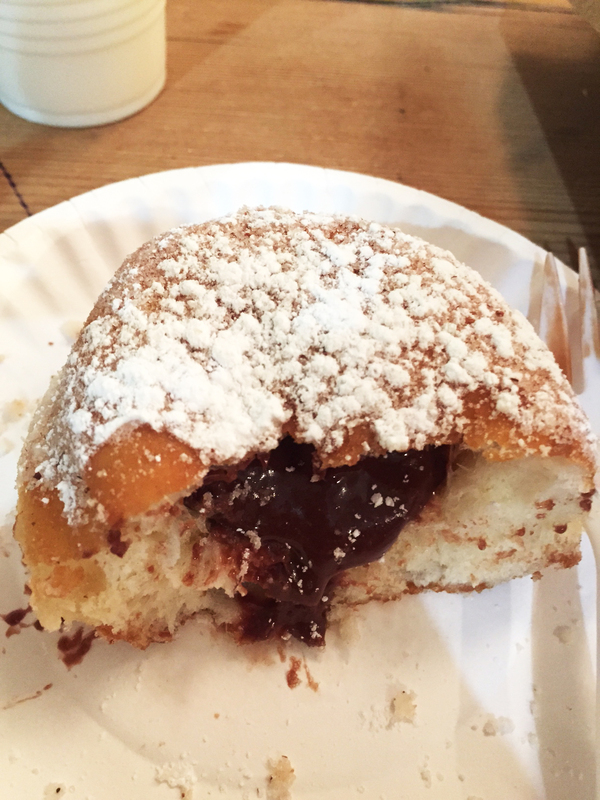 Cailin got a Nutella filled donut and their Chocolate Raspberry flavor. 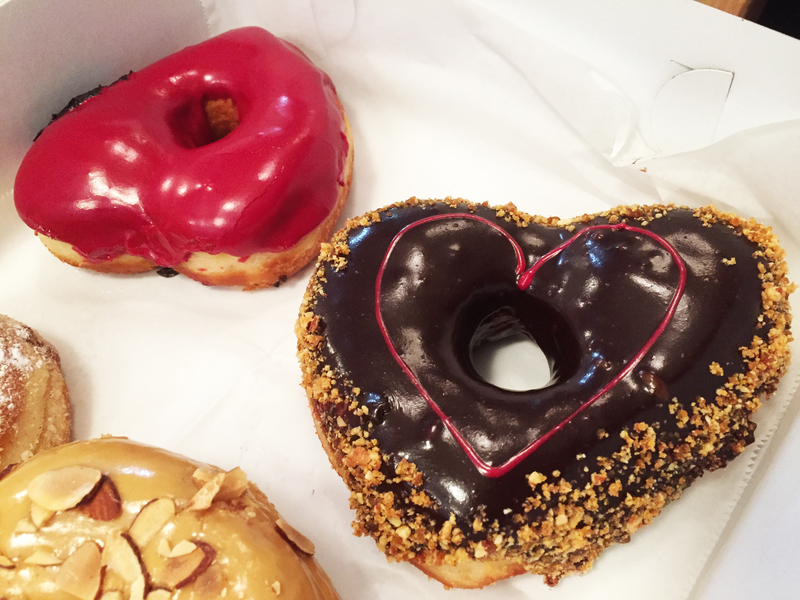 The Hibiscus and Raspberry flavors came in heart shapes to celebrate the holiday! How adorable is that?! They were so delicious. The Hibiscus was really fruity and sweet tasting. 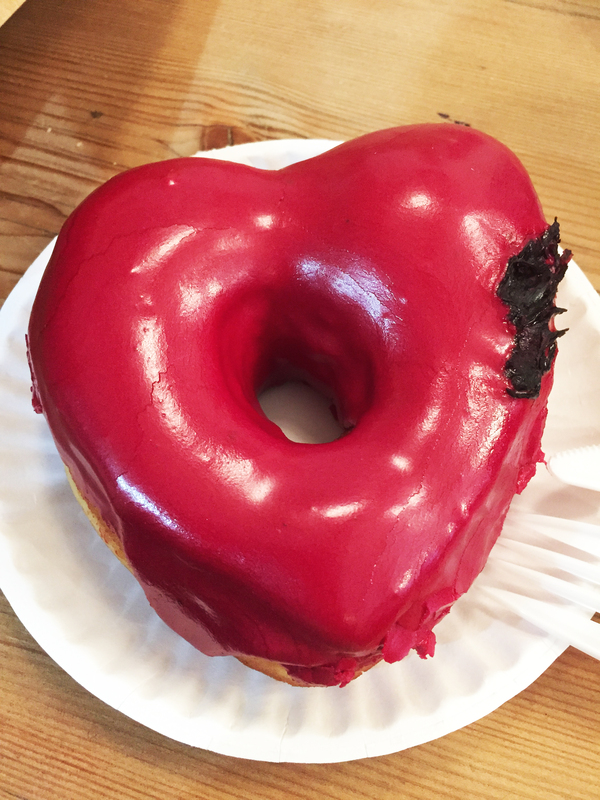 I don’t know how to describe the flavor exactly as I’ve never had anything like it (it gets some of its flavor from actual hibiscus flowers), but if you’ve ever had any fruity flavors on doughnuts before, you’re sure to like this one. 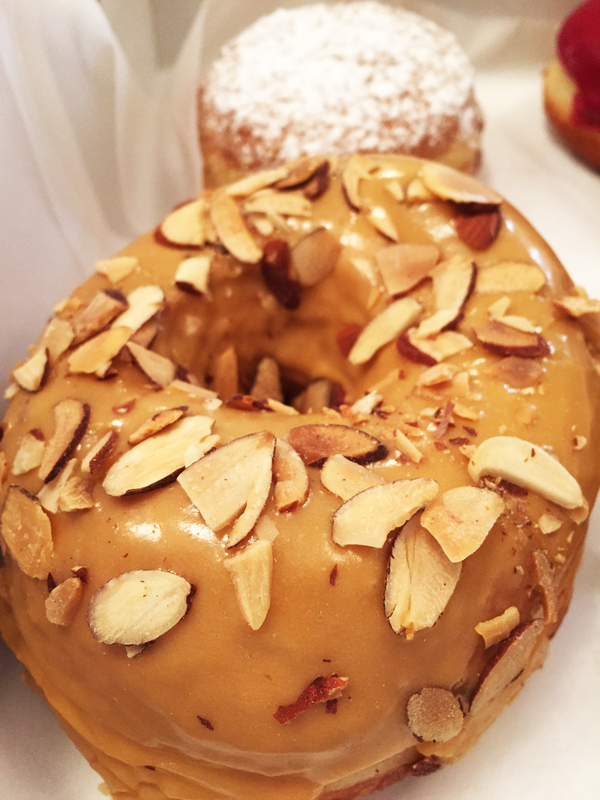 The Dulce de Leche was all the caramelly creamy goodness I thought it’d be and the toasted almonds added a great crunch. 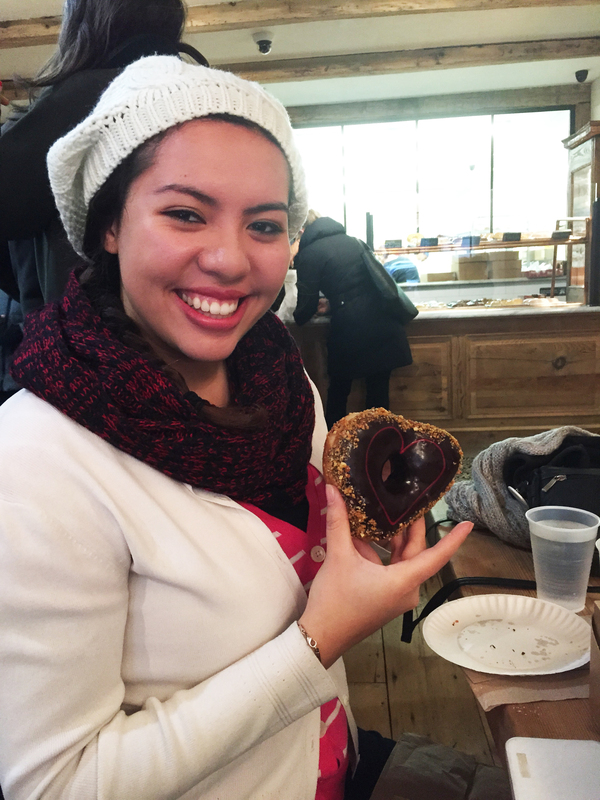 Cailin loved her Nutella filled doughnut as it was the closet thing she’s going to get to the Nutella filled beignets we had in Nice, France. 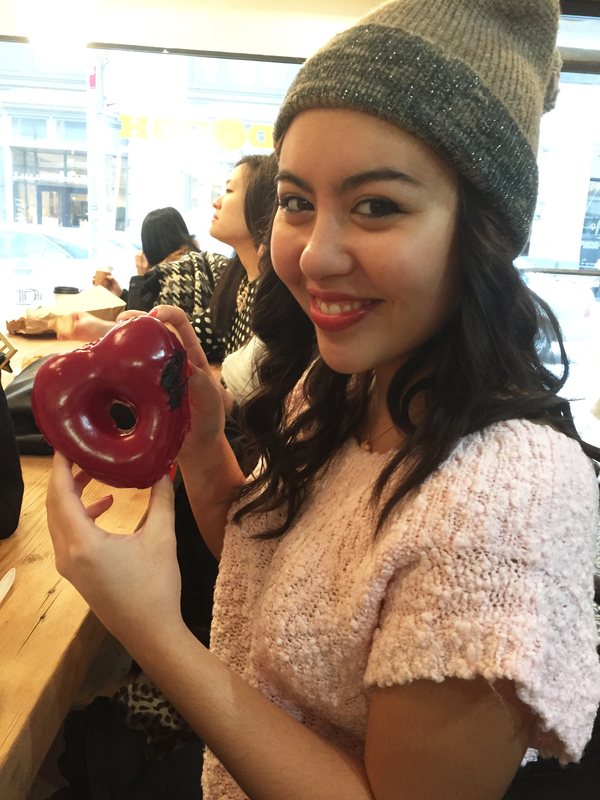 She just wished it was a little larger, since the size is much smaller in comparison to the non-filled doughnuts. Cailin is a lover of all things chocolate raspberry so she undoubtably loved that the raspberry flavor really held its own against the chocolate. 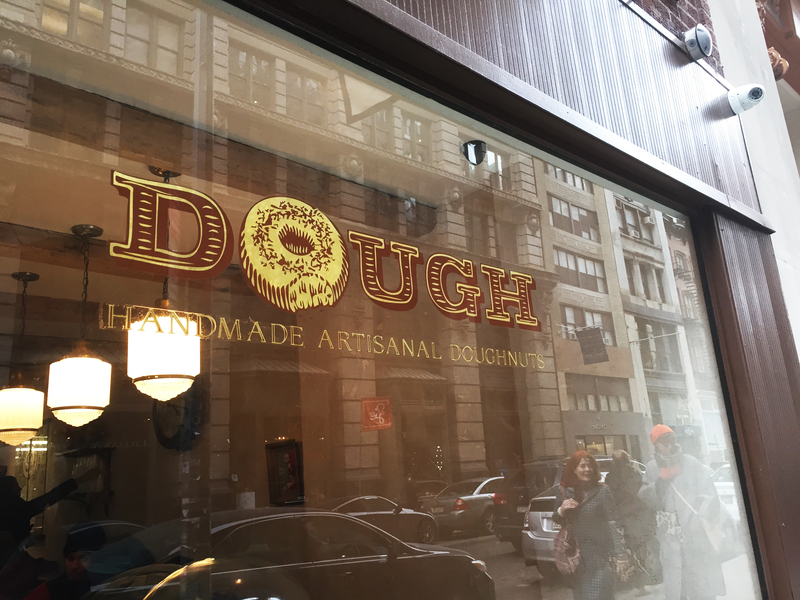 In addition to the innovative flavors what I liked most was how crispy the dough was on the outside and how light and fluffy it was on the inside. 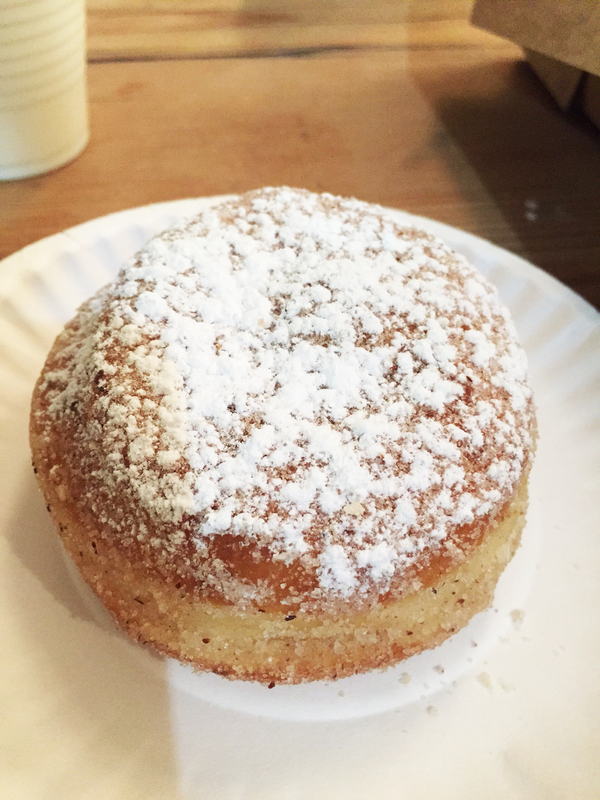 The crisp was similar in taste and texture to actual fried dough. YUM! They also aren’t stingy with the amount of glaze they put on, so you never have a bite that isn’t as good as the next. 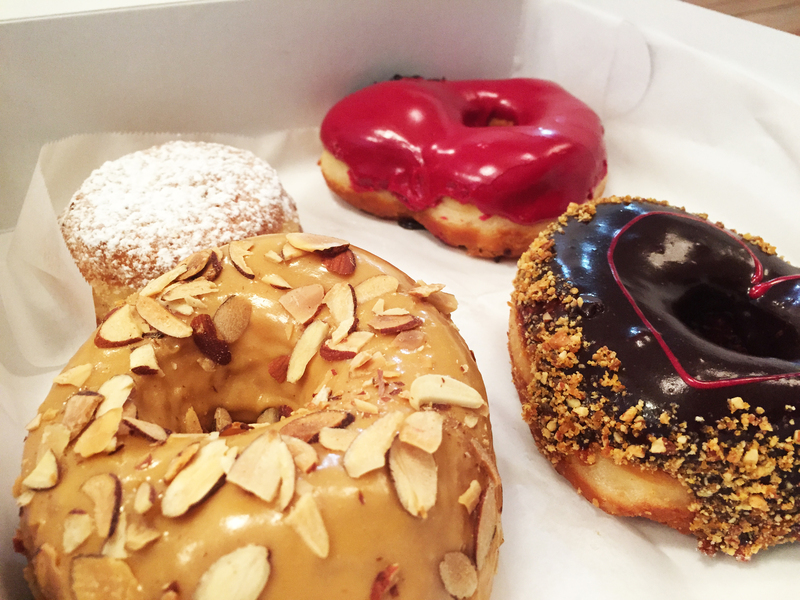 We can’t wait to try some more flavors on our next visit. 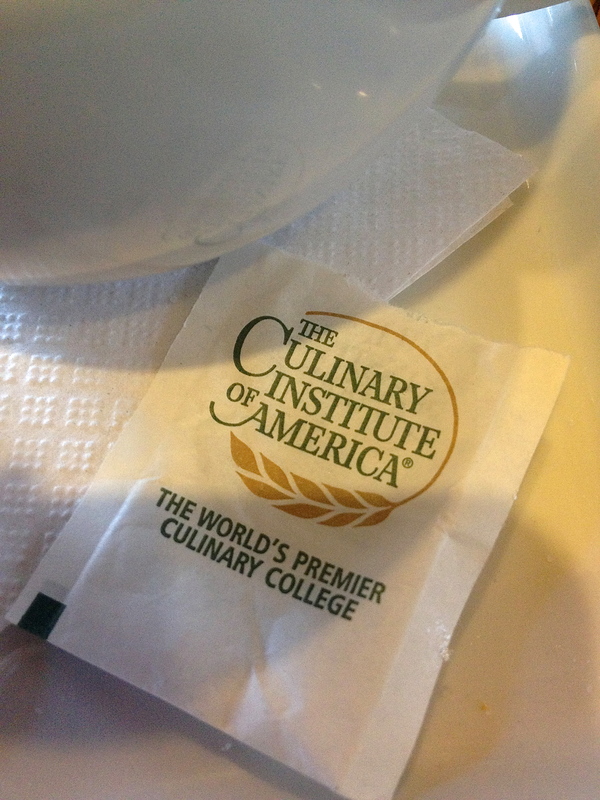 Today I tagged along with Tara to the Culinary Institute of America (CIA) to eat lunch at the cafe they have there. She was meeting someone for a job interview, but I love CIA so I wanted to go get some food too! 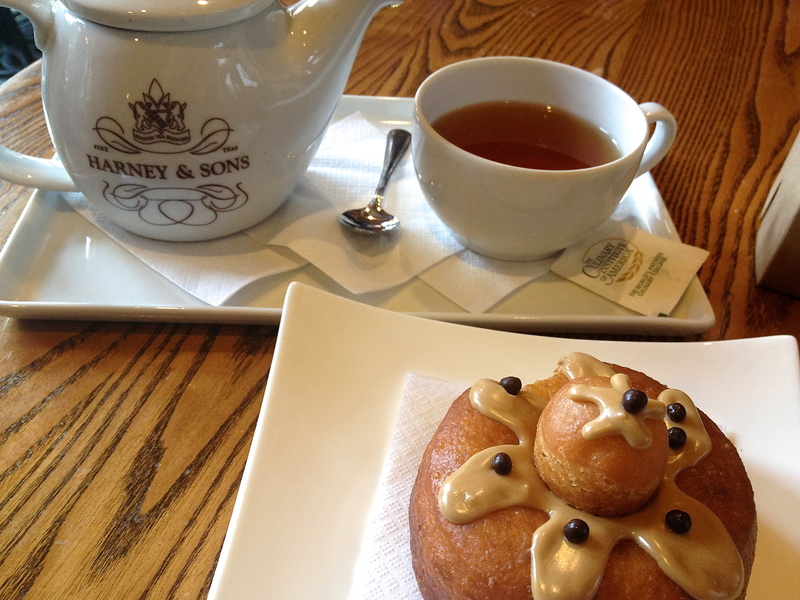 I had been there two times before but only had items from their lunch menu, and this time I was feeling tea and a pastry. 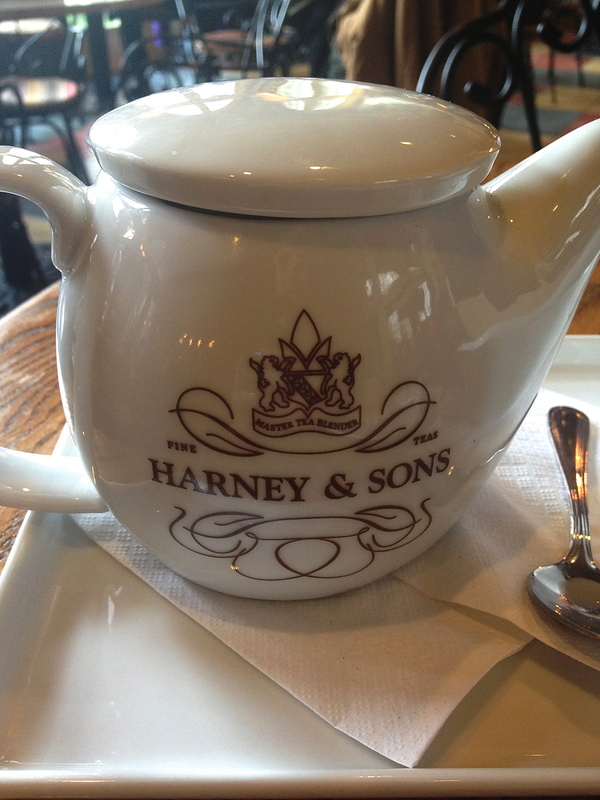 After living in London for almost four months, I’ve learned to love tea with scones, biscuits, or crumpets. 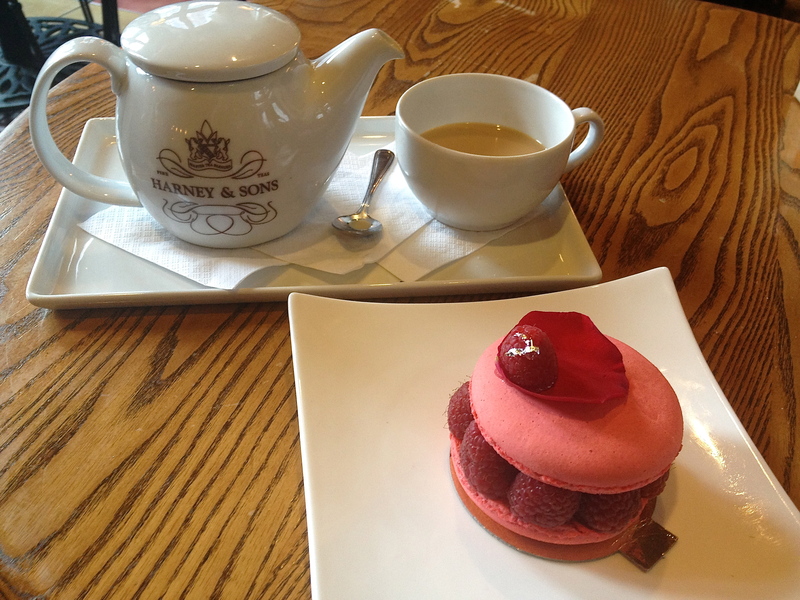 Since the cafe is known for their pastries, desserts, and macarons, I thought what better place to have tea time?! 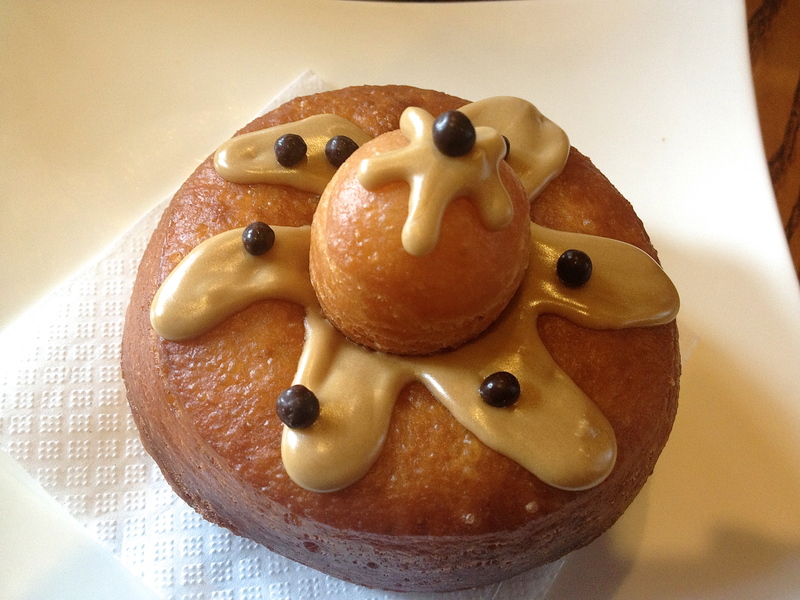 The cafe is completely run by the institute’s students so they have some really great chefs who are constantly practicing and making new things. Every time you go, there’s something different and they make all of their food look so beautiful! 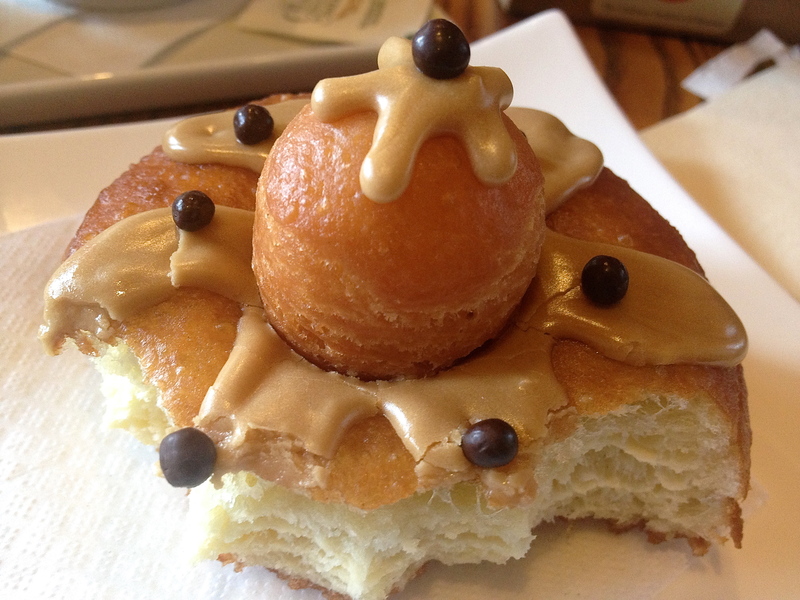 For today though, the Maple Frosted Brioche Donut looked pretty appetizing so I got that with a pot of English Breakfast Tea. 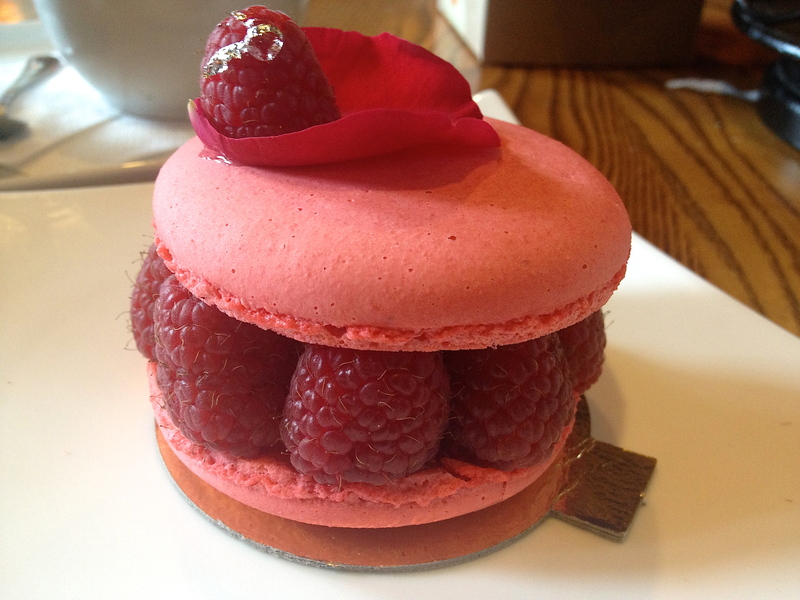 I then got a Raspberry Macaron Tart to split with Tara after her interview was over as a treat!